Municipal Court Defense Attorney David W. Polsky, has been providing experienced, affordable legal assistance throughout northern New Jersey since 1995 . The Law Offices of David W. Polsky will make you feel confident that you chose them for all your legal needs. When you utilize my legal services, you will not only get my personalized individual attention, but that you will also have my years of experience as a licensed attorney to protect and fight for your legal rights. If you have been issued a Criminal or Municipal Court Summons, I will diligently represent you in court to get the charges reduced or dismissed. 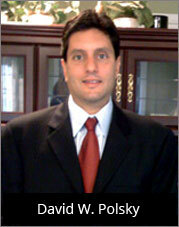 I will always personally handle your matter from start to conclusion, and never assign your case to anther attorney.